Today I found out that it currently costs more than double what pennies and nickels are worth to produce them. In 2006, the U.S. Mint sent a letter to Congress informing them that for the first time in history, it cost more to produce a penny and nickel than the coins themselves were worth. Including materials, machinery, labor, shipping, and other such costs, they estimated it would cost 1.23 cents to produce a penny and 5.73 cents for a nickel at that time. The situation has since become much worse. In 2007, the costs association with producing a nickel swelled to 9.5 cents. Currently, it costs about 2.4 cents (1.1 cents in metals) to produce a penny and 11.2 cents (6 cents in metals) to produce a nickel. Because of this, the U.S. mint regularly receives calls from citizens to find out the exact amount of the materials in them and the legality of melting down the coins to sell for profit. The mint became so nervous about the potential for mass hording and melting down of coins that it enacted new rules to prohibit the practice. These new rules made it illegal, with a few exceptions, to melt down or export large amounts of U.S. coins. Specifically, you are only allowed to take $5 in these coins out of the country or ship $100 worth of them at any one time. Punishment for violating these laws will get you up to $10,000 in fines and up to 5 years in prison. Because the value of the materials exceeds the value of the coin, whether to change the composition of these coins or just get rid of them altogether has been hotly debated in many political circles. However, because the U.S. Mint is one of a few governmental agencies allowed to make a profit and they overall make a huge profit on all the coins they produce, so far nothing has been done to change this situation. How the system works is that when the Federal Reserve wants to release more of these coins into circulation, it buys them from the Mint at face value. If it costs less to make the coin than it’s worth, then the Mint will profit. If not, then the Mint will take a loss. The Mint is able to continue producing these coins at a loss because they make such a huge profit on other coins, such as quarters, which only cost around 9 cents to produce, and half dollars, which only cost around 15 cents. Even more profitable are dollar coins, which only cost around 10 cents to produce. All this has resulted in the U.S. Mint typically making a huge profit on coins, despite the penny and nickel. For instance, in 2005, the total profit for the U.S. Mint was $730 million. The loss taken by producing pennies and nickels that year was estimated at only $45 million. In 2012, it is estimated that this loss will swell to $100 million. This may change soon as President Obama’s proposed budget for the United States in 2013 includes a mandate that the Treasury Department change the composition of pennies and nickels so that they won’t cost more than they’re worth. However, it should be noted that the President brought this same issue up in 2010, but it ended up being shot down, largely thanks to heavy lobbying by a variety of different business groups who would be negatively impacted by the switch. 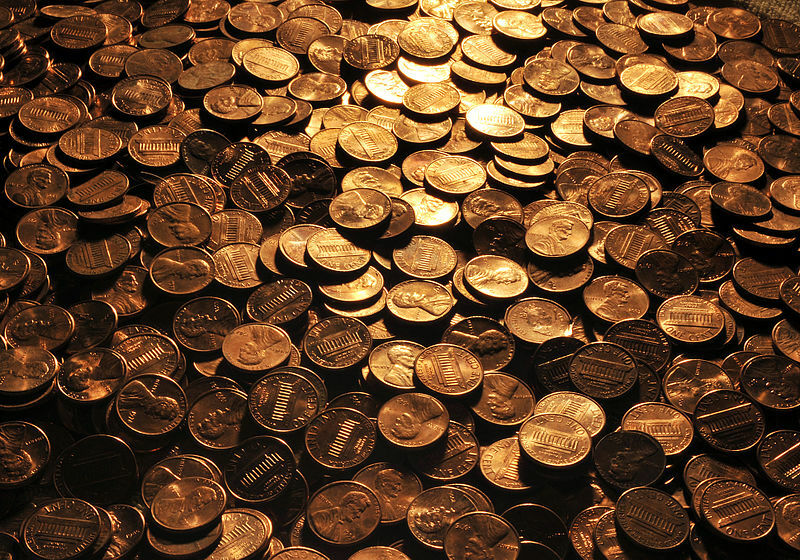 Contrary to popular belief, pennies are not actually made primarily of copper; rather, they are currently made of 97.5% zinc and 2.5% copper. They haven’t been made of pure copper since 1837 when copper prices began to rise above acceptable levels for production. Since then, the composition has been changed several times until 1982 when it was changed to its current ratios. The 2.5% copper plating was retained only to keep the pennies looking and feeling the same as when they were made with much higher copper percentages. Nickels have similarly had their compositions changed over the years. For instance, during WWII a special 35% silver, 56% copper, and 9% manganese nickel was introduced to help preserve nickel supplies for the war. Today, nickels are 25% nickel and 75% copper. In 2006, U.S. Representative Jim Kolb introduced the COIN Act (Currency Overhaul for an Industrious Nation). This act would make it law to round all cash transactions off to the nearest 5 cents. The purpose was to make the penny obsolete. This was the second time he introduced such legislation. Like the first time he attempted such a bill, this one never reached the house floor for a vote. In April of 1792, the U.S. Mint was created by congress under The Coinage Act. This authorized construction of a building to house the Mint. This building was the first federal building constructed under the new U.S. Constitution. The phrase “In God We Trust” was first introduced on two-cent coins in 1864. Congress approved an Act that allowed the motto after a minister wrote a letter to the Secretary of Treasury in 1861 suggesting that God be recognized on U.S. Coins. In 1907, the Mint omitted “In God We Trust” on new gold coins. Public criticism of this became so great that in 1908 Congress passed legislation that made it mandatory to have the motto on all coins on which it had previously appeared. In 1955, further legislation was passed that made it mandatory for all currency of the United States to have that motto. Further, on July 30, 1956, “In God We Trust” became the national motto of the United States. Since then, there have been challenges in federal court to the appearance of the phrase “In God We Trust” on currency. However, these challenges have achieved little success in lower courts and, to date, the Supreme Court has declined to hear any of the cases pertaining to this. Only four men have appeared on U.S. coins while still alive. They are President Calvin Coolidge, Governor T.E. Kilby, Senator Carter Glass, and Senator Joseph T. Robinson. Only three women have appeared on circulating coins. They are Helen Keller, Sacagawea, and Susan B. Anthony. The U.S. Mint, in addition to producing coins, is the agency responsible for protecting all of the nation’s gold and silver assets. President Lincoln faces to the right on pennies. All other U.S. Circulating coins have the portraits facing left. This was not a decision made by the mint, but rather the choice of the designer. @Anonymous: I already did (see the references). I saw it stated somewhere before about Lincoln facing the opposite direction, supposedly they “turned their back” on him for freeing the slaves. The last pure copper cents were issued in 1857, not 1837.